In an article published this month in the journal Conservation Biology members of the UKTPWG and colleagues identify and map threats to the recently-described intact peatlands of the Pastaza-Marañón Foreland Basin in north-east Peru. They highlight the need to protect these peatlands to avoid future degradation, and identify several key pathways for conservation. The authors found that, in their case study area, the main threat to peatland health is the expansion of commercial agriculture linked to the development of new transport infrastructure, which makes it easier for companies to access remote areas. Although some of the peatlands in the PMFB were found to fall within existing legally protected areas such as national parks, this protection is patchy, often weak, and not focused on protecting the most carbon-rich areas. The article argues that conservation efforts should be focused in the first instance on the most carbon-rich peatlands, such as those north of the Marañón which currently lie entirely outside of the legally protected areas. This week, Sarah Cook, a member of the UK TPWG and PhD student at the University of Leicester, published an exciting paper documenting a new, low cost and easy-to-use methodology for measuring DOC losses from tropical peatlands. Here she describes this important work. My research is focused on investigating fluvial organic carbon (TOC) losses from tropical peatland oil palm plantations, within Southeast Asia. However, when I first started developing my research methodology I found limited guidance for analysing tropical TOC water samples. Tropical work is often undertaken in remote field sites with limited on-site laboratory facilities (if any), with any flat stable surface (i.e. the dinner table, car boot and concrete floors) quickly becoming a state of the art workbench. In addition, temperature also plays a significant role, with the hot sticky heat quickly degrading anything remotely organic. In my case this could mean the breakdown, and loss, of significant proportions of organic carbon from my water samples. This also meant the need to ship large, heavy and expensive boxes of samples back to the UK for analysis on specialised analytical equipment. Collection of fluvial organic carbon from an oil palm plantation drainage channel. Graphical abstract from the Water Research paper, showing an example of a plantation drainage channel and predictive ability of the UV model. 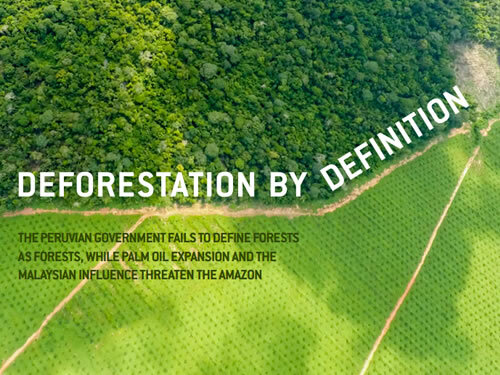 The Environmental Investigation Agency (EIA) has recently published a report, Deforestion by Definition, that describes some of the primary causes of deforestation in Peru, and the complexities of the issue. Some of the areas where deforestation is rampant are close to the peatlands where members of the UK TPWG are doing important research: trying to highlight their location and document their ecological, economic and societal value before the loggers and diggers reach them.